Wix is a true What You See Is What You Get (WYSIWYG) web builder—but that makes it insanely easy to create a website, because you can see what you are doing as you work, without navigating through a bunch of menus. As one of the simplest web platforms we've reviewed so far, Wix is an excellent choice for those with no web design experience. Signing up for a Wix site is just a matter of providing a name and email, then users are taken straight to a variety of template options. Wix has a wide variety of templates that appeal to more than just one business type – there are options for businesses and online stores, but also for photographers, musicians other creative artists, as well as restaurants. 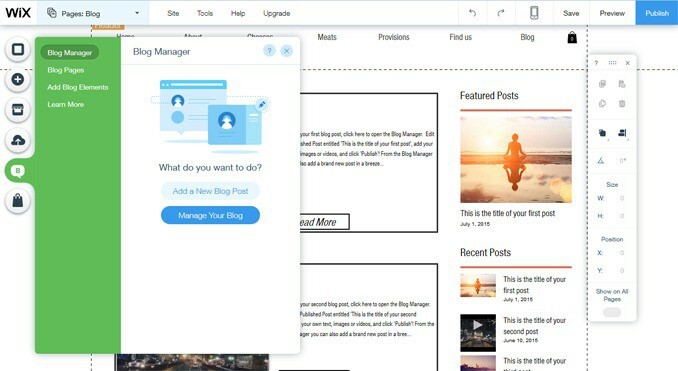 Once the template is selected, users are taken right to the editor—which looks a lot like the actual site, with the exception of a few more toolbars and menus. That look lends a lot to just how easy it is to use Wix. Since the Wix editor looks so much like the actual website, it's surprisingly easy to use. Want to edit that text? Click on it, you'll see the text editing options and even the option to add animation. Want to change the background? Click there. That photo? You guessed it, just click on it. Users can even click on the navigation bar to either edit it, or to navigate to the other pages. The visual style of the editor means there's very little digging through menus to find the right feature. Of course, that's just for updating what the template has already filled in for you. Users don't have to stick with just what the template offers though. The left hand navigation icons include a plus sign—clicking on that allows users to add elements like text and images, as well as slideshows and apps. That element is added when clicked, it can then be moved around the page simply by dragging. Editing options, again, show up when the new item is clicked. Multiple pages are also added based on the template chosen. The top icon on the left hand side of the editor (it looks like a blank page) takes you to the pages that are there and also allows you to add new ones. Pages can be added completely blank or set up with templates like About pages and image portfolios. The downside to the easy-to-use web builder is that there aren't many advanced features—though realistically, most users won't even notice. Users can't add their own HTML code directly, though, an HTML code app allows for the addition of external code. While most simple web builders also have simple storefronts with few features, Wix seems to buck that trend. While perhaps not quite as full-featured as Shopify, Wix offers more than just the basics, including allowing for coupon codes and setting shipping and tax options. Head to the store by clicking on the pages option, then shop. 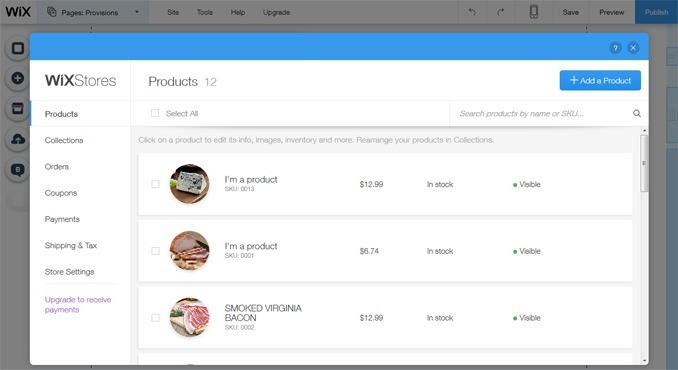 When a product is clicked, users will see an option that takes them to a window for editing the available products. In keeping with the simplicity of the platform, new users are taken right to a 3-minute introductory video on using the store. Even without the video though, the storefront is pretty straightforward. Tabs organize the basic options, including orders, products, payment and currency, coupons, shipping, and tax. Products are organized by collection, both of which can be added easily. Clicking on “Add a Product” takes users to a new window with all the fields for adding details about the product, including the name, images or video, text, price and sale price, and a ribbon or special note over the product. Options (such as size and color) can also be added, but users are limited to just two options per product. That won't be a problem for most, but if, say, a cosmetics company has different scents, different sizes and different skin type options for one product, they'll have to add the items as separate products because of that two-option limit. Just like adding products, adjusting storefront options is pretty straightforward. 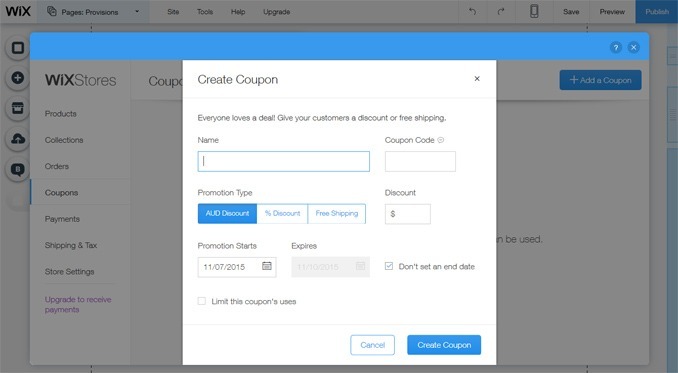 Despite being a simpler editor, users can still add coupon codes in the coupon tab, choosing the dates, discount, and limits. Shipping and tax options are also available and not something that is part of a high-priced package. Blogs can be added to any Wix website as well. Most templates will have them already, or they can be added the same way a regular page is added. A quick tour walks new users through the steps, but again it's pretty straightforward. Clicking on a post takes users to an editor that WordPress users will find easy to adjust to. Posts can be marked as featured to show up in the sidebar, and using tags to organize posts is also an option. Adding and changing elements on the Wix website builder is pretty straightforward, but there are a few options for adjusting the design available by clicking on the paintbrush icon. Fonts, color options, and the page background are among the customizable options. Edits like adding your logo to the header are all done in the editing mode, so the design options aren't in an overwhelming number. 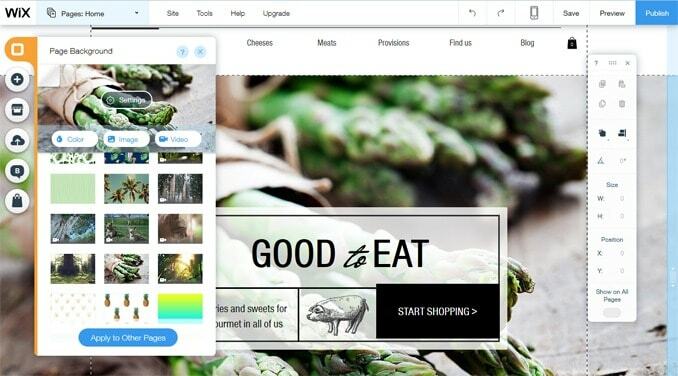 Wix templates are pretty well designed, though Wix has some unusual PowerPoint-like features, including adding transitions between pages and animations. These might be a feature some find in handy, but just like fancy animations aren't very professional in a business PowerPoint, many will be better off leaving those options alone. At any time during the editing, the site can also be previewed as the mobile version instead of the full version using the icons at the top left of the editor. While it's a simple system to use, help articles are available without even leaving the editor, by clicking on the question mark in the upper right. A full support center is available as well, if users don't find what they are looking for in the basic help. 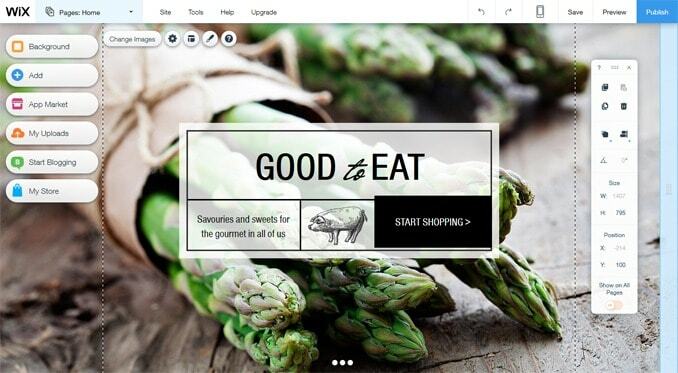 Wix is a great website builder for those with no web design experience. Edits are based on what you see, so there's very minimal searching to find the right option. Both stores and blogs have a handy quick guide and are easy to use. Despite being a simple web builder, there's still quite a few features. While advanced users will notice the lack of using custom HTML code, features like coupon codes are still included without paying for an expensive package. 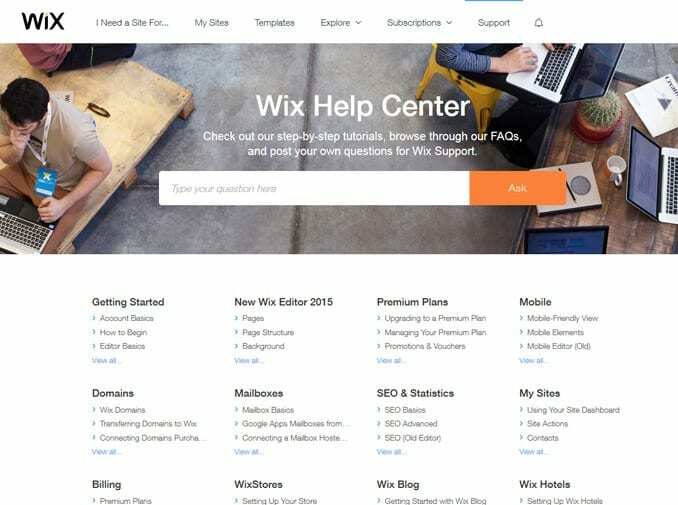 Prices for Wix start at $4.08 a month (when paid annually) and shopping carts are available in the $16.17 or $24.90 plans, both which also include a .com for the first year. The prices seem to be great value based on what Wix is has to offer. As a simple web builder that still offers solid design, Wix is well-suited for small business owners nervous about creating their first DIY business website.